> MDGs: No more excuses! > Mitigation or adaptation in Central America? There are signs of a change of trend in international agricultural trade policy: an increasing number of actors is questioning the role of free trade as a motor for rural development. One example for this change of trend is this year’s collapse of the WTO Doha Round negotiations, due, among other things, to the fact that various developing countries refused to open their agriculture unconditionally to the global market. Their concerns are not without reason. A study has examined the chances and risks of agricultural trade liberalisation in Latin America, where tariffs were reduced from an average of 50% in 1985 to 10% in 2002. Although some large-scale producers have benefited from improved export opportunities, the overall impact of liberalisation on rural development has been negative. Cheap imports and diminishing government support have driven many local producers to ruin. Increasing export production in the form of monocultures has caused numerous ecological problems. Moreover, many Latin American countries have become dependent from the outside: from large corporations to buy their produce, from agricultural inputs such as seed and pesticides, and also from food imports. The authors use the example of Mexico, among others, to demonstrate the negative consequences of liberalisation. Mexico achieved privileged access to the US market through the North American Free Trade Agreement already in 1994. While this did lead to an increase in the country’s exports, imports increased even more. Subsidised maize from the USA pushed many Mexican small farmers off the market, salaries in agriculture dropped, and 500,000 farm workers lost their jobs. However, if overall conditions are favourable, small farmers certainly do have possibilities to benefit from market access. 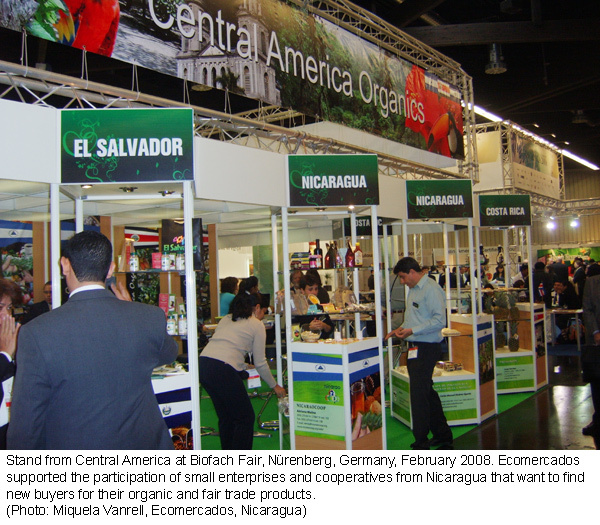 The Ecomercados project seeks to create such possibilities by promoting niche markets for organic and fair-trade products. It supports small and medium-sized farms in Central America in becoming more competitive. At the same time it supplies local export-promoting organisations with information on organic farming and fair trade. Project activities include workshops, trade fairs and publications, as well as a website with a directory of producers and importers of organic products. A recent set of guidelines points out yet another way for poor population groups to improve their income: by marketing so-called “neglected and under-utilised species”. The advantage of such crops is that they usually have highly specific uses based on traditional knowledge, are adapted to marginal conditions and correspond to a market trend. However, marketing activities must be carefully prepared in order for poor farmers – who cannot afford to run high risks – to really benefit from such crops. Offers must be adapted to market opportunities, and the architecture of value chains must be given thorough consideration. Where this succeeds, cultivation of neglected and under-utilised species can contribute not only to improving food security, but also to promoting agrobiodiversity. The international trade system must allow for developing countries to regulate their imports and exports in order to protect vulnerable population groups and resources. The study from Latin America demonstrates that free trade per se does not reduce poverty. National governments must promote the productivity of family farms by improving overall conditions at the national level. Small farmers can only benefit from market opportunities if they receive adequate support. The 1992 Earth Summit in Rio defined environmental democracy as access rights to information, public participation and justice in relation to the environment. This study looks at the progress which has been made in the intervening 15 years with regard to honouring these rights, and evaluates what remains to be done in the future. Given that implementation problems have affected governments and access proponents alike, the recommendations set out in the report are aimed at both of these stakeholders. For example, the report found that several governments lacked the legal frameworks needed to collect and disseminate information. As a result, measures should be introduced which would identify any shortcomings in terms of the collection, archiving, analysis and dissemination of information. This implies the enactment of appropriate legislation to remedy the situation as well as the provision of adequate budgetary support. As far as access proponents are concerned, it is essential that they strengthen and develop their existing networks to enable them to lobby more effectively for transparent political reforms. Only then will those who are most affected by the dearth of environmental democracy have the chance to let their voices be heard. Source: Voice and choice: Opening the door to environmental democracy. Joseph Foti et al. World Resource Institute. 2008. 138 p.
“When is a promise not a promise? When it is made by the G8.” This is how a recent OXFAM report slightly ironically characterises the promises made every year by the G8 to the poor countries. The statement could be extended to all wealthy countries: measured against the Millennium Development Goals (MDGs), only very few of the promised initiatives have been implemented so far, even though half of the time has elapsed. A little over seven years ago, 147 states regarded the goals on the agenda as realistic and promised to contribute to achieving them, above all in financial terms. Now half-time is past, and the kaleidoscope of negative facts in the various MDG focal areas reveals how grotesquely little has been achieved. The credibility of the rich nations is at stake. How come only 0.28 percent of the industrialised nations’ gross income currently flows into development cooperation, even though the demand to raise this amount to 0.7 percent has been voiced since 1970, and in 1962 the amount spent was 0.5 percent? Positive examples mentioned in the report show that much can be achieved in a short time even in the poorest countries – like in Rwanda, where the number of child deaths from Malaria could be reduced by two thirds within the past two years. OXFAM thus urgently calls upon the rich countries to enforce the necessary measures in economic, trade, environmental and development policy without compromise at this year’s international conferences. Source: Credibility Crunch. Food, poverty, and climate change: an agenda for rich-country leaders. Oxfam Briefing Paper 113, 2008. 39p. Mitigation or adaptation in Central America? Central America is in the process of defining a regional strategy to meet the challenge of climate change. This jointly developed strategy will help the countries of the region to have a voice in global discussions and negotiations on climate change. Which direction shall the strategy take? PRISMA, a civil society organisation in El Salvador, has voiced its opinion in contribution to the strategy building process. According to the analysts from PRISMA, Central American mitigation initiatives mediated through global carbon markets are neither pro-active, nor are they sufficient to meet the enormous challenges ahead. They are limited to reducing greenhouse gas emissions and do not stimulate local processes. The alternative strategy of adaptation arises from the need to focus on the poor living in rural communities vulnerable to climatic change. Adaptation focuses on capacity building, diversification of livelihoods, and forging resilience to meet the challenges of climate change. It goes beyond the mechanisms mediated by the markets and requires a broad approach that encompasses social, environmental and territorial issues. Moreover, it calls for a public policy framework to stimulate the necessary changes through a sustainable development agenda for the Central American region. Source: ¿Mitigación o adaptación en Centroamérica? : Construyendo una agenda propia frente al cambio climático. Nelson Cuéllar y Susan Kandel. Programa Salvadoreño de Investigación sobre Desarrollo y Medio Ambiente (PRISMA). 2008. 16 p.
Rising global demand and political responses to food safety and climate change bring ever greater pressure to bear on forests and their communities. As a result, life for these forest people is now marked by a heightened sense of vulnerability and growing conflicts. Yet, this crisis offers an opportunity to put the rights of indigenous peoples and forest communities back at the top of the agenda, but without ignoring the rights to environmental services which forest ecosystems provide. This is not simply a moral issue, but a political, social, economic and environmental one. Basing itself on the activities of the Rights and Resources Initiative (RRI), the present report provides new analyses and options with regard to the reform of forest tenure systems. The key stage in this reform process is undoubtedly the identification of stakeholders and the definition of their roles (formulation of laws, data collection and dissemination, and dialogue within the communities). To ensure the implementation of these reforms, the RRI itself needs to maintain a high level of visibility and regularly monitor the efforts of international organisations and national governments. Source: From Exclusion to Ownership? Challenges and Opportunities in Advancing Forest Tenure Reform. William D. Sunderlin, Jeffrey Hatcher and Megan Liddle. RRI, 2008. 54 p.
What are the interests linked to agricultural land in a mountain region in a development context? This question is not easily answered. Farm households, agronomists, the ministry of agriculture – all the various actors have different interests. In 2004 a multi-disciplinarily and multi-institutionally based research project was launched in a traditional mountain agriculture system in Vietnam, under the aegis of the Management of Soil Erosion Consortium. The aim of this project was to improve soil management. This aim was achieved rapidly and to the full satisfaction of all actors involved. How? One important factor was to regard farmers’ interests as the linchpin of all other interests. From the very beginning, farmers were actively involved and contributed to shaping the process of integrating livestock into their traditional cultivation system. On steep areas farmers began to grow slope-stabilising fodder cereals, thereby immediately stopping erosion. Alongside these activities, the project also included an adaptation of market structures. However, what finally enabled the project idea to develop into a regional self-runner was the improvements achieved in the farmers’ income. Details about this successful project and further articles on the same topic can be read in the June 08 issue (Vol. 24/2) of the LEISA Magazine. The traditional milk sector in India impacts over 150 million producer and consumer households. Despite its potential to improve the livelihoods of millions of poor, it remains a neglected sector – in contrast with the well-organised private and cooperative sector, which has seen tremendous growth over the past 30 years due to large investments. A project entitled “Capitalisation of Livestock Programme Experiences in India” (CALPI) engaged in a multi-stakeholder participatory action research initiative to uncover the ins and outs of the long-established traditional milk sector. The project has created an enabling environment for key actors to discuss the issues faced by small-scale milk producers, vendors and consumers, and it has revealed the importance of the sector with regard to pro-poor market access and livelihood security. Another CALPI initiative focused on a multi-stakeholder consultative process to develop a widely owned reform action plan for policy and structural adjustments in livestock service delivery. The participatory process demonstrated the importance of involving all key stakeholders in order to reach a wide acceptance and implementability of the reforms. In the process, special attention was paid to involvement and service needs of the poorest. The initiative has led to the development of a set of recommendations for structural adjustments in livestock service delivery. Africa is the Earth’s warmest continent, with around 60% of its surface covered by deserts and arid areas. 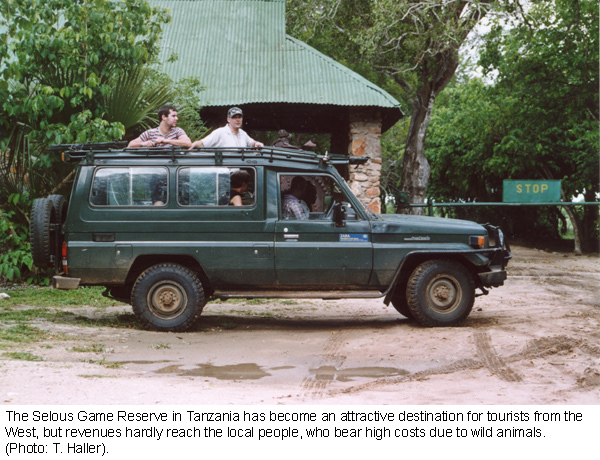 At the same time Africa is extremely rich in natural resources and accommodates over 3,000 protected areas. This wealth is increasingly in danger. Africa’s ecosystems suffer from population growth, urbanisation, unsustainable development strategies, conflicts and migration. The poor economic situation makes it impossible for African states to take the necessary countermeasures. These countries are thus particularly vulnerable to the impacts of climate-change-induced phenomena and natural disasters. Using satellite imagery, graphics and photography, a new atlas provides an impressive visualisation of the change in Africa’s features over the past 30 years and its consequences. The authors identify deforestation as the most urgent threat, followed by loss of biodiversity and land degradation. However, the balance is not entirely negative. 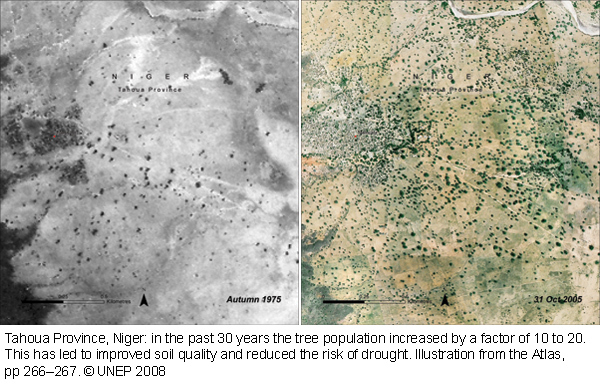 There are also stories of success in the struggle for nature, such as the expansion of wetlands in Mauritania and the revitalisation of land in Niger through planting and cultivation of trees. In recent years various governments in sub-Saharan Africa have begun to outsource agricultural advisory services from government agencies to non-government institutions. The present study summarises first experiences from pilot projects in Uganda, Mozambique, Tanzania and Mali. Agricultural extension is in a state of increasing change. Linear systems of government support are increasingly being superseded by so-called agricultural knowledge and innovation systems. More and more actors are involved in agricultural extension, and farmers are no longer perceived as passive recipients but as active participants who are well aware of what they need. Outsourcing of agricultural advisory services is an institutional innovation that can accommodate these changes. However, outsourcing can only be successful if clear political decisions define objectives and modes of implementation. During implementation, transparent processes for selecting new service providers are just as important as the possibility for farmers to evaluate these service providers. Finally, this innovation can only succeed if local governments, advisory services and farmers have the necessary knowledge to take on their respective roles. Source: Outsourcing agricultural advisory services. Enhancing rural innovation in Sub-Saharan Africa. W. Heemskerk, E. S. Nederlof, B. Wennink. Bulletin 380. Royal Tropical Institute (KIT). 2008. 152 p.
The funds generated by community forestry in Nepal are used primarily to improve the lives of the local population (schools, roads and other infrastructures). Yet, only a small percentage of these benefits accrue to the poorest households. By analysing 100 communities spread across the districts of Lamjung, Tanahu and Kaski (in the west of the country), the present study provides concrete examples and seeks to offer explanations for this situation. Finally, the authors outline what action could be taken to improve matters. Community Forest User Groups (CFUG) have several sources of income. The main source is the sale of timber, followed by the sale of other non-timber forest products, and finally from membership fees and NGO assistance. The CFUGs set timber prices and require advance payment, thus depriving access to the poorest. An alternate system could be introduced which would benefit the poor and the non-poor equally by giving them the option to either buy timber or to receive a share from timber sales. This would mean that the poor would be able to use the income they accumulated over three years from a plot of harvestable forest to purchase timber. Moreover, according to a 2004 study by Kanel and Niraula, a mere three percent of funds, as opposed to the 22% normally claimed, are invested in poverty reduction programmes. Be that as it may, if the poor are to enjoy greater access to these funds, their participation in the executive committees of the CFUGS must be stepped up. Protected areas play a crucial role in conserving healthy ecosystems. Their history and underlying ideologies vary greatly from region to region and depend on the given socio-political framework. Regardless of these differences, all protected areas have been influenced by participatory approaches over the past decades. These approaches aim for more justice and participation by local populations. A study comprising 13 examples from Africa, Asia, Latin America and Switzerland shows that, in practice, this evolution from top-down management to co-determination by all actors involved often falls short of expectations. In addition, expected advantages at the local level usually fail to be generated. Although the picture differs from country to country, the overall conclusions are disillusioning: little evidence was found of economic profit. Political empowerment rarely takes place, and although success is achieved in ecological terms, this is always linked to high costs. Nonetheless, the study concludes that participation certainly can yield positive results. This becomes possible when the various actors identify shared interests and necessary compromises, and adapt their institutional framework accordingly. Source: People, Protected Areas and Global Change: Participatory Conservation in Latin America, Africa, Asia and Europe. M. Galvin and T. Haller (Eds.). Perspectives of the Swiss National Centre of Competence in Research (NCCR) North-South, University of Bern. 2008. 560 p.